Tired of holding bottle while feeding baby? 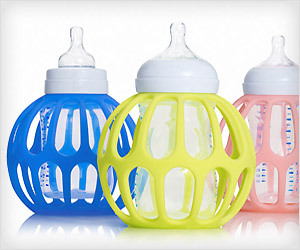 Make baby independent in bottle feeding with assistance of Ba Baby Bottle Holder. It fits standard feeding bottles of popular brands like Avent, Nuk, Pampers, Playtex and allow easy grip for small baby hands.